Noel Whelan is so loyal to Leeds United that he wore the famous club colours under any match-day shirt, particularly when it came to playing against Man United! Amitai Winehouse reports. Whelan played only 48 league games for Leeds, having begun his career at the club, but since his sale in 1995, his love for the Elland Road side has never dampened. Staggeringly, the striker used to go above and beyond to demonstrate his affinity, something that came to the fore whenever he faced off against Manchester United. “People knew when I left Leeds, my love for the club was there and it would never ever die, no matter what shirt I played in,” he said. “When I scored against Manchester United for Middlesbrough, I gave the Leeds salute. It would have been difficult for Whelan to top his first experience when playing against the Lancashire club though. Representing the team he holds dearest, Whelan was part of the FA Youth Cup win in 1993 – the culmination of what was already a long journey to get to that point. 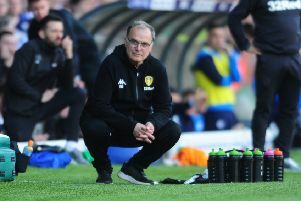 He revealed: “When I signed for Leeds, they were the last club to come in for me, and I’d been waiting for them to make an approach. I’d been at different clubs, who wanted me to sign schoolboy forms, but I turned them down because I wanted to sign for Leeds. “When I got to Leeds, it was a dream come true – they’re the only club I ever wanted to play for. When Whelan talks about actually playing for the first team at Leeds, you can hear the enthusiasm that accompanies every single word. His first game was something that he would have fantasised about since childhood. It’s clearly hard for Whelan to pick out specific moments that he enjoyed more than others at Leeds. When asked about a particular goal, his spectacular bicycle kick against Chelsea, he almost dismisses the quality of the goal. Sadly for Whelan, his time at Leeds was cut short. Coventry manager Ron Atkinson made a bid of £2 million for him, which Leeds accepted. It was a low point in Whelan’s career. “I was in tears in bed when I got the phone call from Howard Wilkinson. It’s just one of those moments that you dread. He always held out hope that he might be able to return to Elland Road, and thought he was close to a transfer at one point in his career. Whelan has been able to represent Leeds in other ways, not least in a Yorkshire Masters victory in 2011. Playing for Leeds in that context doesn’t seem to be any different to his time at the club as a professional. He said: “I’ve got my shirt still from the Masters. It was another proud moment for me. We managed to go on and win it. I had a slipped disc at the time, but I managed to manage the team through the rounds. The former Middlesbrough man has recently become more involved with the football on a weekly basis, providing commentary for BBC Radio Leeds. Whelan has immediately struck up an affinity with the fans that carries on from the love they shared when he played for Leeds. He feels as though he’s no different to the fans watching, except that he has an opportunity to give voice to how they feel. “When we’ve played well, we’ve played well, when we’ve played bad we’ve played bad,” Whelan said, “If things are going on in the background that aren’t fair to the players and the manager, it’s not right to skirt around it. “I can see it, there’s no point lying about it. It is what it is. I’ll always be honest. I played with my heart on my sleeve and I’ll do the same on the radio.